Located on route 21 in Naples, NY. This is a three in one Restaurant. 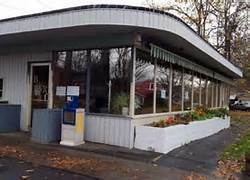 The front part of the building is a diner style restaurant with stools, tables and booths. They offer traditional diner meals with some local favorites. The back part of the building is the Vineyard Restaurant, offering an Italian menu, with some steaks and seafood dishes. Most dishes in the $ 20.00 range. On the side of the building is a ice cream stand that offers a wide variety of flavors. The ice cream stand is a popular stop for locals and visitors during the summer. We enjoyed lunch in the diner, good at meal. Debbie and I shared a burger and had a house salad each. The rest of the crew had burgers also. Bob & Ruth’s has been here for over 60 plus years, the diner décor is a little out dated but clean. Very popular eatery for both the locals and visitors.